Last weekend we saw The Play That Goes Wrong. I didn't know anything about it before we saw it. Oh my gosh, it was so funny! I enjoyed it a lot and at times I was laughing so much I was nearly crying. 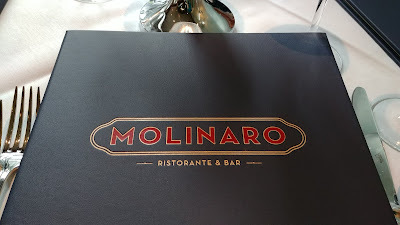 After the show, we went to dinner at Molinaro Ristorante & Bar in Market Square. Molinaro is in the space previously occupied by Poros. I think the restaurant just opened this past late June/early July. There is a great outdoor dining space, but after week of very hot and humid weather, it was suddenly breezy and quite chilly. We did not dine outside. Bread & olive oil. 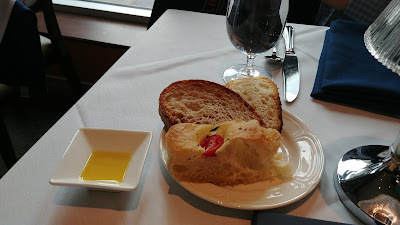 A focaccia with tomato and rosemary, a white, and a brown. 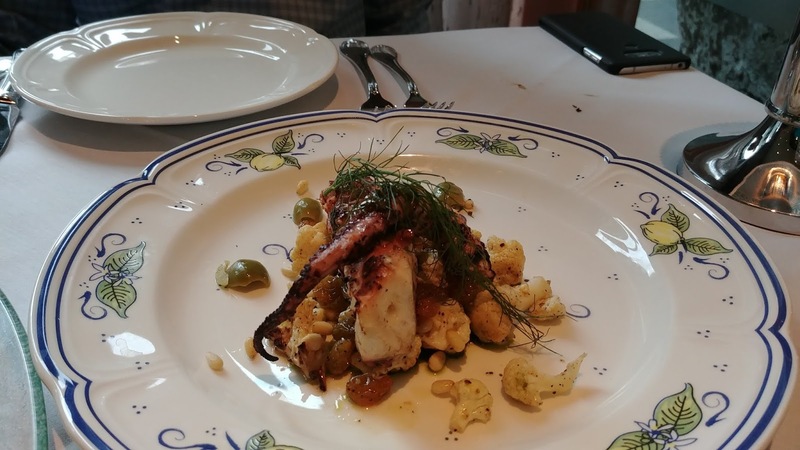 SP's starter: Piovra (grilled spanish rock octopus, menaica anchovies sauce, cauliflower, pine nuts, raisins). Yum! Daily Special - Three Cheeses with Three Mini Salads. 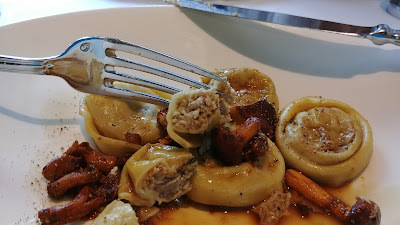 In the lower right of the photo, ricotta with a zucchini salad (my favorite). On the left is a smoked scamorza next to a tomato-onion-basil salad. 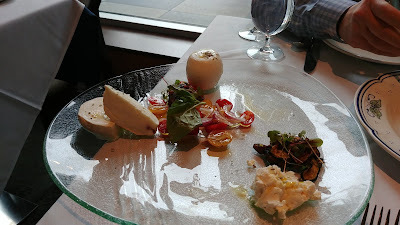 At the top is mozzarella (or was it burrata? I want to say burrata but the receipt says mozzarella and I can't remember) and hidden behind the scamorza and tomatoes is an eggplant salad. It was excellent. I did share with SP but I probably could have eaten all the cheese myself. 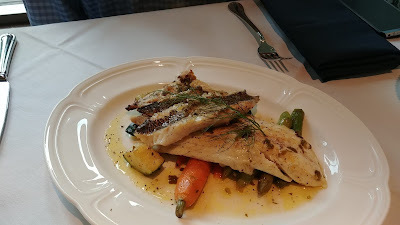 SP's main meal: Daily Special - Mixed Grill: mackerel, branzino, and sea bass atop carrots and asparagus. 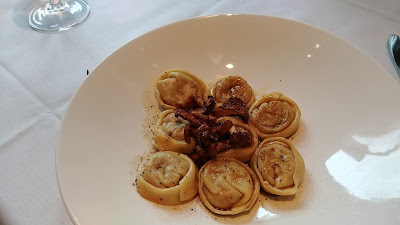 I tried to get a wee bite of mushroom with each bite of ravioli because together, the veal-pasta-mushroom flavors were so darn tasty. SP ordered an after dinner drink: Grappa. 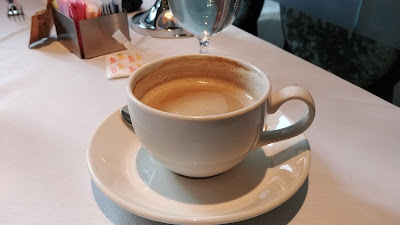 I took one sniff and knew better than to try the tiniest of sips. Too strong for me. Crispy on the outside, light and airy inside, smooth, cool cream and a raspberry. I shared, but I think I allowed him a half of one. SP chose Italian Cheesecake - with pear in it and berries on top/around it. Overall, I enjoyed Molinaro. 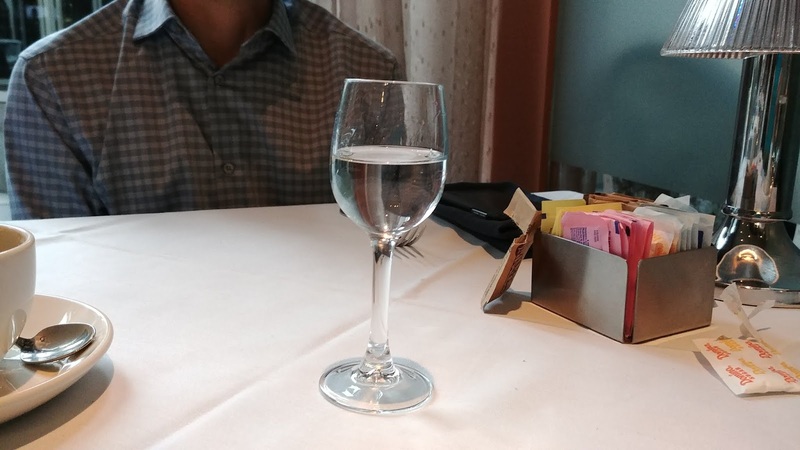 I was trying to decide between two wines and our server brought me a sample of each to try. Our server was great, answering questions, informed, pleasant & smiling. The meal was nicely paced. The food tasty. I can't really find anything wrong. And yet. 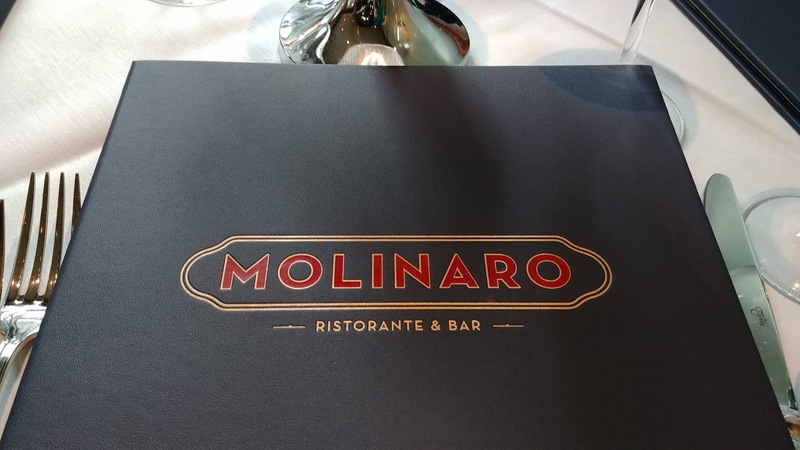 I think it comes down to this: Molinaro is a pretty darn expensive place. 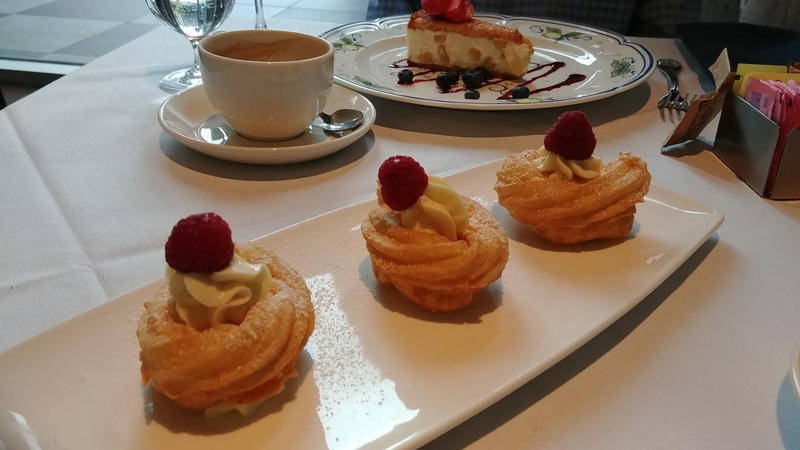 Maybe we didn't need 2 appetizers, or 2 desserts, or the grappa and cappuccinos. But even without those, the bill + tax & tip would have been well over $100. It might just be us. I guess we are not cheap dates?! Since it was a daily special, I didn't realize just how much the cheese plate was ($28). When we eat out, we like to get foods we do not cook at home, like octopus, which happens to be one of the priciest appetizers ($19). So when I look at it like that, that it's one of the priciest meals we've had in Pittsburgh, that we spent more than we do at other places in/near the Cultural District when we dine out after shows, I'm not sure I can overlook the dirt we found on the tablecloth under SP's bread plate. Or the construction noise (?) that seemed to start up around 6:30 pm on a Saturday - ? At least that's what the noise sounded like. I was glad we dined right after the show ended so we were leaving shortly after the noise started. 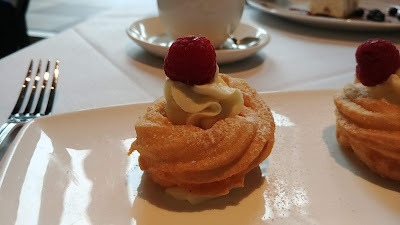 But the food was good, especially those zeppole. I'm sure we'll be back because delicious pasta, cheese, and donuts are three of my very favorite things. *Full disclosure: Due to a mishap with our leftover dinner food, we were not charged for desserts/cappuccinos. That wasn't necessary. It is appreciated. 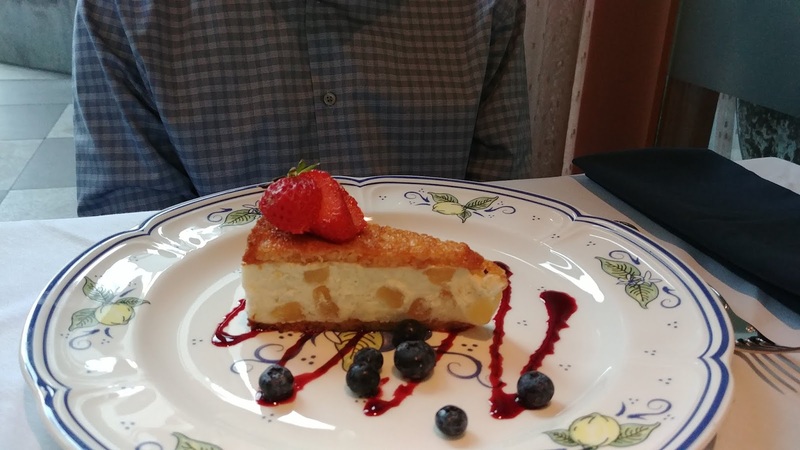 We did attempt to calculate what they would have cost and then tip on the bill + the dessert/cappuccino cost. We were still surprised how much it added up.